Look! Up in the Sky! It’s a Flying Orange Man With Wieners on His Belt! Remember when Jeff Bezos showed up on 60 Minutes in 2013 and promised that Amazon would soon be whisking packages through the air to your home by drone? Well, five years later, there’s still no sign of Amazon Octocopters hovering over our doorsteps—but for Oscar Mayer, air delivery of hot dogs is a future that arrives today. 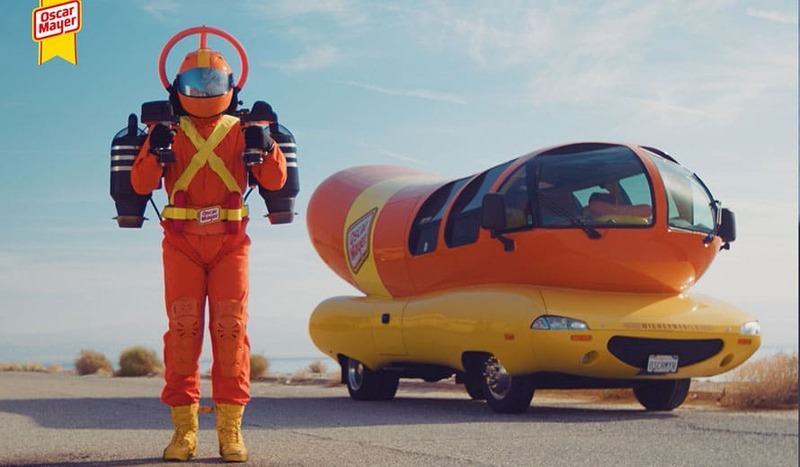 Oscar Mayer is taking the wraps off Super Hotdogger, a flying all-beef superhero who “stops at nothing to deliver better Oscar Mayer Hot Dogs to the hands of hot dog lovers across America,” according to the company. Clad in orange spandex and a mirrored-visor helmet, this airborne mascot (vaguely reminiscent of a Mighty Morphin Power Ranger) has a belt equipped with “aerodynamic hot dog carrying cases.” Super Hotdogger’s airborne aptitudes come courtesy of the JetPack strapped to his back. His helmet, meanwhile, boasts a technology that allows Super Hotdogger to zero in on hungry targets. In that respect, he’ll have his work cut out for him. Oscar Mayer’s superhero makes his public debut today with two flights from Piers 16 and 17 in lower Manhattan, but it’ll take more flights than that to deliver frankfurters to New York City’s 8.5 million residents, who’ll all be getting hungry around the same time. 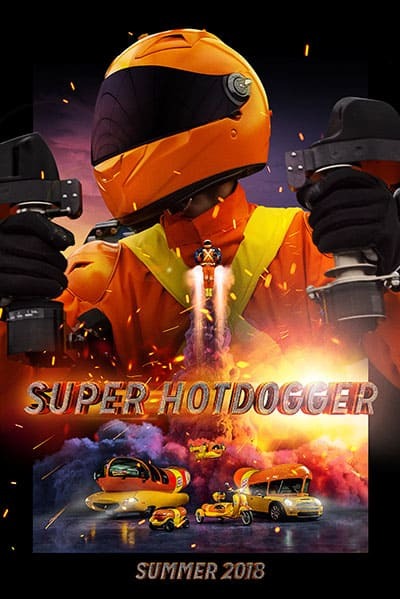 Good thing that Super Hotdogger’s actual purpose is marketing—specifically, making select appearances with the Weinermobile, which is currently out on its summer tour. 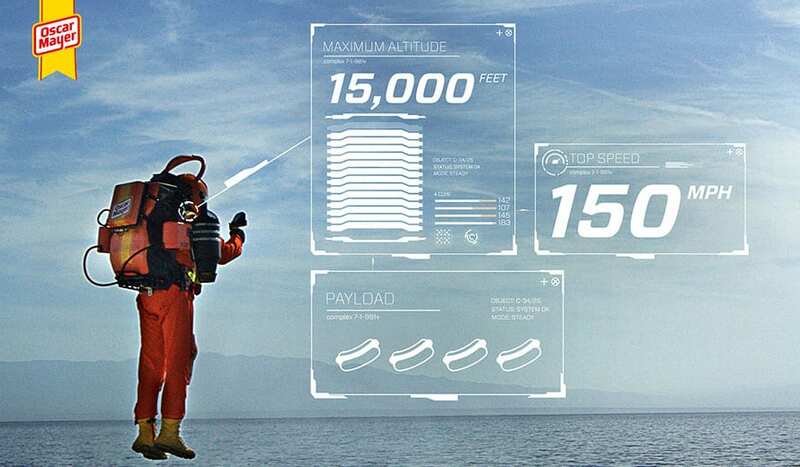 It may well be true that more men have walked on the moon (12, according to CBS News) than have flown around with a JetPack, but even so, the technology isn’t new. A Bell Aerosystems engineer named Wendell Moore first developed what he called a Small Rocket Lift Device in the late 1950s. Originally designed for use by astronauts on lunar landings (it never was), the jet-equipped backpack quickly became a talisman of postwar science fiction. It did find a handful of earthbound uses, though none more than crowd-pleasing gimmickry. In the James Bond series, Q built 007 a JetPack, which he employs to get out of a tight spot in the 1965 film Thunderball. Incredibly enough, actor Bob Denver used one in an episode of Gilligan’s Island. 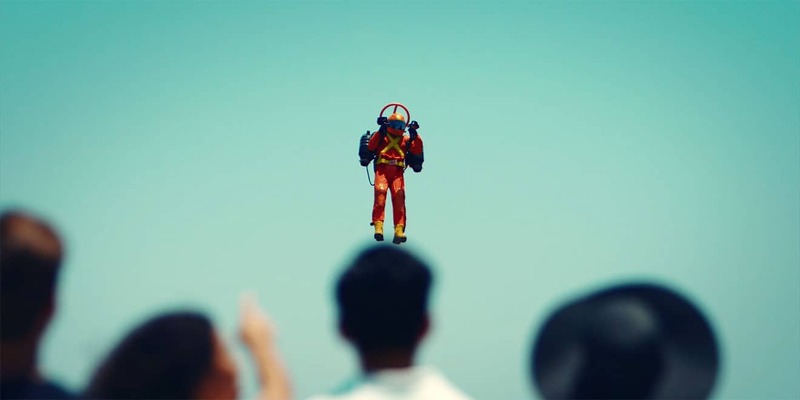 And a JetPack routine was part of the opening ceremonies at the 1984 Olympics in Los Angeles. Alas, Super Hotdogger, your superpowers are nothing new. But in terms of drawing attention to nitrate-free, bun-length beef franks? Yours is a stratospheric achievement.